Penelope "Jaxx" Faure is part computer scientist specializing in large databases, data distribution algorithms and programming. Another part is psychologist with clinical training as well as specialized psychological test theory and testing. Using her long experience as businesswoman, teacher, trainer, as well as utilizing years of meditation, and garnering related teachings and experiences, she puts a new edge on the meaning of wealth visualization and how to do it. Melding the latest mind/body theories with meditation she moves past the usual practices to offer new ways and insights into wealth visualizing and materialization for the newcomer. 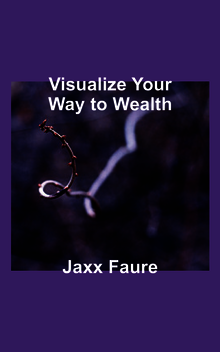 Programming the subconscious to actualize wealth though not trivial, is doable. She offers unique insight into the problems and points the way to solutions in this book.